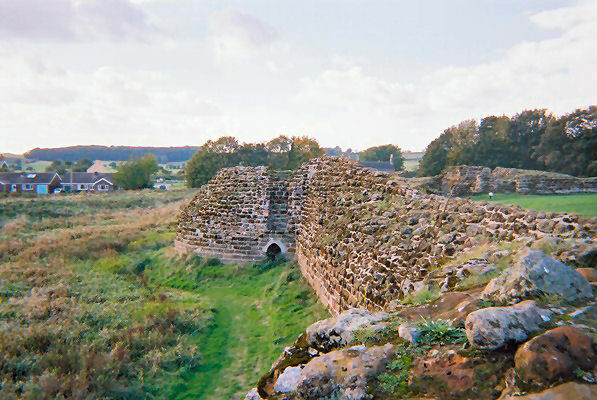 Notes: Bolingbroke Castle is a ruined castle in Bolingbroke (or Old Bolingbroke) Lincolnshire, England. The area was first fortified by the Saxons in the 6th or 7th century. In the 12th century the Normans built a Motte and bailey on a nearby hill above the settlement of Bolingbroke. The present structure was founded by Ranulf, Earl of Chester, in 1220 shortly after he returned from the Fifth Crusade. Ranulf died in 1232 without a male heir, and his titles, lands and castles passed to his sisters. Following the death of Henry of Grosmont, 1st Duke of Lancaster in 1361 Bolingbroke passed through marriage into the ownership of John of Gaunt. His wife Blanche of Lancaster, daughter of Henry of Grosmont, was born at the Castle in 1345. John and Blanche's son, Henry, was also born at Bolingbroke Castle in 1367 and consequentially was known as "Henry Bolingbroke" before he became king in 1399. By the 15th and 16th century, the castle had fallen into disrepair although repairs were carried out during the Tudor period. In 1636 a survey found that all of the towers were effectively beyond repair. At the start of the First English Civil War, Bolingbroke was again put to use as a military fortification garrisoned by Royalist forces. In 1643 it was badly damaged in a siege during the Battle of Winceby. The following year, the castle was recaptured from the Parliamentarians but due to defeats elsewhere was relinquished again. In 1652 the castle was slighted to prevent any further use. The towers and walls were torn down and dumped into the moat. The last major structure collapsed in 1815. The castle, which is now a national monument, was excavated in the 1960s and 1970s. It was maintained by English Heritage up until 1995 when Heritage Lincolnshire took ownership. Much of the lower walls are still visible as are the ground floors of the towers. In the summertime, the castle is home to numerous events including performances of Shakespeare. Friends of Bolingbroke castle. "Bolingbroke Castle"